One year ago today my husband Seth passed away. Life has a very strange way of teaching people lessons. When Seth got sick at age 30, I thought that we were being taught some of the most important life lessons one could learn. I learned that life is precious. I learned that no one is immune to adversity. I learned to slow down and I learned to appreciate everything, especially the small things. 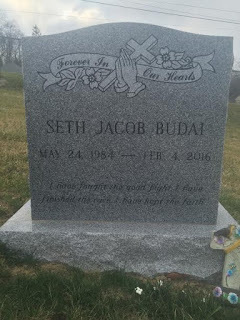 But on that summer day in 2014, when Seth and I were told that there was a tumor on his sacrum and that he would need to be rushed to Boston for further work-up, I could not have imagined that the lessons had only just begun. I would never truly understand how important these lessons were for another 19 months. One year ago to the day, my favorite person passed away in a cold, sterile, hospital room. The week prior he and I had sat down with his doctor to go over his advanced directives. It was his wish not to be put on life support and to die peacefully in our own home. He never did make it home like he had hoped to. Selfishly, I am so glad that he did not because one year later I am finally beginning to feel at peace inside our four walls. As I sat alone with Seth in the hospital room, and the doctor looked at me with those "I'm sorry..." eyes to tell me Seth had passed, I was in such despair that I never thought I would feel at peace again. A month later I moved back into our house and it felt so cold. It felt painfully quiet, eerie, and especially lonely. Today, as I write this I feel a sense of calmness come over me that I thought I may never experience again. One year later I feel the most at peace when I am home. Inside those four walls I can picture Seth sitting at the bottom of the stairs trying unsuccessfully to put his shoes on while the dog is jumping all over him. I shut my eyes and I can see him sleeping peacefully in bed while I was getting ready to leave for work. I would go over to kiss him on the forehead on my way out. In the basement, I can picture us where we lay sprawled out on the floor, bursting with excitement the very night we closed on our house. We were so proud that we had bought on our very first home together and that it was finally ours! When I am inside my house I feel closest to Seth because I am reminded of a beautiful family that loved each other dearly. It was only Seth, the dog, the cat and I. We never did have children together. But we were happy with our little unit that we called family. Selfishly, I am glad that Seth never made it home. Had he been here when he passed, I am not sure that I could find this sense of peace from being home that I now so desperately try to hold on to. Over the last year I have have been told over and over again how strong of a woman that I am. It is hard for me to believe that because it has been a long, very exhausting, journey. For days after Seth died I only ate pizza and drank coffee. I slept a lot and quite honestly I don't even remember planning the funeral or the memorial services. Somehow I managed to go back to work, to move back home, and I took care of all of the business needs that are required after someone dies. Looking back, I have no idea how I was capable of doing all of that. The process after someone dies is exhausting, and there is not much help that anyone can give you. When I reflect on all that I accomplished I understand why people consider me strong. But when you are going through this you feel nothing short of a failure. There is a constant feeling that something has been forgotten. Every piece of paperwork that needs to be completed and the accounts that need to be closed take multiple phone calls and multiple attempts to near completion. You begin to wonder why you are so stupid. You cannot understand why things are so difficult and why you don't do them right the first time. For the first year, every action that I took made me feel a tremendous amount of guilt. You wonder, am I honoring Seth right? Does Seth know that I loved him? If I do this, or go there, will other people think that I have moved on? Will people think that I have forgotten my husband? If I feel lonely and think about a day when I might find new love, does this mean I am cheating on my husband? What will our friends and family think of me just for thinking that I am saddened by the loss of sharing my life with someone? Why do I care so much what other people think? Do I really care what other people think or am I just judging myself for my thoughts because I don't want to have them? And so on. 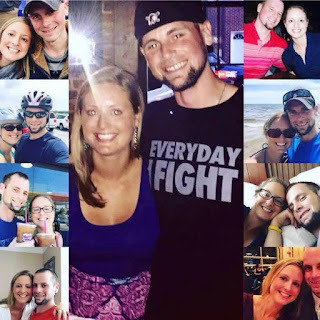 The first year has been a very long year filled with worries that I desperately wanted to get out of my head all the while trying to honor my husband while living my own life. When I started this blog I called it Journeys with Seth. Over time my entries stopped being letters to Seth and opportunities for me to work through my own personal journey. Twelve months ago I thought my journey with Seth had just started, but in reality our journey had just ended and a new path began for me. Despite the anxiety that my inner monologue created, I am so proud of myself for working hard to push forward despite it. And although this is my own life I am paving for myself, I am without a doubt that Seth has been by my side throughout it all. In 2014 when Seth got Sick he handled the circumstances he was given gracefully. He was grateful for our family, friends, and jobs. He found purpose through the students that he worked with daily. He laughed, he cried, he was stubborn, he got angry, and he fought hard for his life. He fought hard for the people that he loved. He fought hard for me. When I look back on the last 12 months, I realize that I have been strong. I have made mistakes. I have been blindsided by grief. I thought that I figured my feelings out only to find out I don't understand my feelings at all. But I have lived. I have laughed. I have honored Seth. I have loved. And, I have been strong (or so they tell me). Seth taught me what it is to fight for your life, and I have fought. On this one year anniversary I am deeply saddened by the loss of my best friend. I cannot believe one year of my life has passed without him by my side. He is still my best friend, how can it be possible that he is gone? After one year, how can this still be so shocking? And yet I am also so amazed by myself. I made it one year and people tell me that I did well. Maybe I did? Maybe these lessons that I have learned have been invaluable. I know that I am lucky for every day that I have been given. I know there are real problems in this world that are worth spending time on and others which are not really problems at all. Seth showed me that we are not always dealt the best hand, but we should fight through it anyway. We should do our best to enjoy the ride because we are only given one life. We are only given one chance to leave an imprint on this world. I hope one day that I can leave half the imprint that my husband left on this world. I have read that year two is harder than year one for widows and widowers. I expect that this year will bring me new challenges. But I am done identifying myself as a widow. My husband died one year ago and as we rode in the ambulance to the hospital I promised him that I would be alright. I promised him that I would live my life fully. I promised him that I would be happy again. The term widow is sad. It is a name indicating that I have been hurt. I don't want this challenge to label me. I want it to empower me just as my husband used his challenges to empower him. I want to live my life fully because of my husband. I want to enjoy life for my husband. In this way, I will honor my husband. I imagine that the next year will still be difficult. I am certain I will have my set-backs. But I am also certain that I will get up every single day, put my feet on the ground, and take steps forward to find out who the new Meredith is and what my life has in store for me. In 2014 I learned that life is precious and one year ago my husband reminded me of this tough lesson. I am so lucky to have had the marriage that I did with Seth. He was kind, sweet, goofy, stubborn as hell, always right (or so he said), smart, loving, and generous. Seth cared about others more than he did of himself. He devoted his life to helping others and to being a wonderful son, brother, husband, etc. He will never go forgotten by me no matter where I go on this journey we call life. Because of my husband I will remain strong. Because of my husband, I know that it is okay to not be okay. But because of my husband, I know that I will be okay. I love you Seth. Mere-roo, I am so glad you wrote this. You working through this process has brought me joy, respect, fear and hope. I am so proud of you for being able to publicly post something like this and send you so much love. I truly hope year 2 is not worse, but if it is, know that I'm here for you.